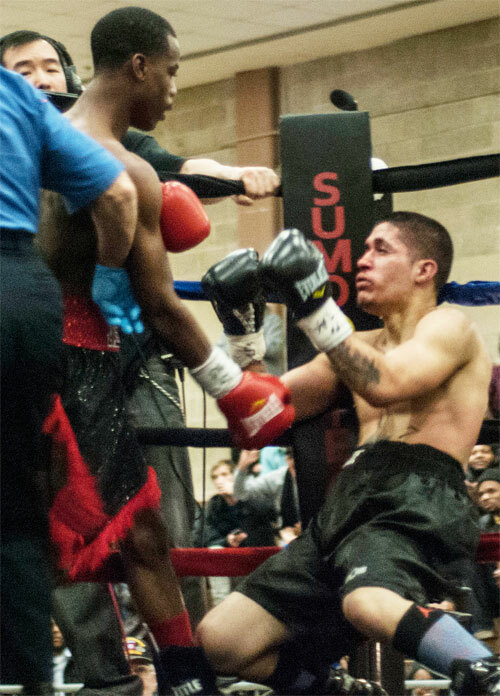 Photos by Darryl Cobb Jr.
17-year old Milton Santiago, a junior welterweight with a storied amateur background, said goodbye to fighting for free Friday night, and made his professional debut at the National Guard Armory. The Warminster, PA boxer scored a quick knockout of Moses Molina to start his pro run before a crowd of more than 1,000 fans in Northeast Philly. 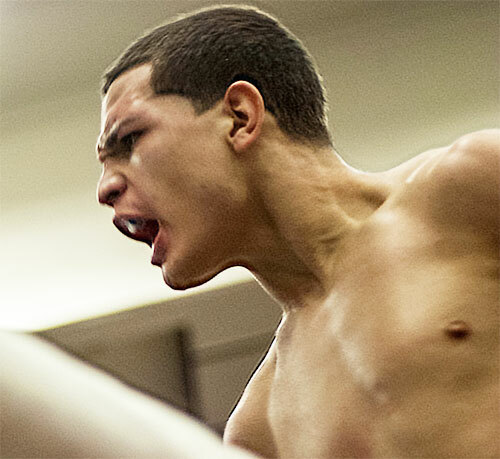 It isn't often that a young fighter making his pro debut merits the main event slot on his very first night as a pro, but such was the case with Santiago. His reputation as an amateur standout, and the anticipation of his future success, made him the star attraction on a card filled with other heralded local stars. 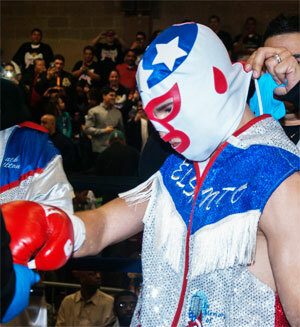 With his large cheering section whipped into a frenzy, Santiago entered the ring proudly decked out in his Puerto Rican red, white and blue colors, complete with a full-faced sequined Luche-style wresting mask that evoked El Santo, the Mexican wrestler who carried the same nickname as Santiago now uses (El Santo, The Saint). Everyone at the Armory was ready to see the birth of a brand new boxing star, and Santiago did his part to keep the expectations surrounding him sky-high. His performance was exactly what his fans had hoped for. 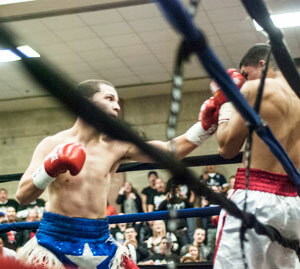 Santiago charged out at the bell and took control of the bout immediately. Milton pressured his frightened foe around the ring, tossing serious punches all the while. Suddenly after about one minute had elapsed, Santiago whipped a hard left hook to the body that sent Molina crumbling to the canvas. The Bridgeton, NJ fighter started to rise, but apparently changed his mind. He got to one knee, but made it no further than that. Referee Steve Smoger counted to ten, and the National Guard Armory erupted in celebration. The time of the quick KO was 1:16. Molina's record slipped to 1-5. "It felt great," Santiago said after the bout. "I just want to thank God. Without God none of this is possible." It was the perfect start for Santiago. He gave his fans confirmation that the promise he showed in the amateur ranks would carry over into the pros. So far, so good. At 17, he still has a long climb ahead of him, but this was the emphatic win that was expected, and Santiago pulled it off beautifully. Apparently managers Moz Gonzales and Eddie Woods had to campaign hard to get permission from the PA Boxing Commission for the under-18 boxer to obtain a license. The managers did their job, and Santiago did his. Before the fight, Eddie Woods said that they planned to keep Santiago's schedule packed, predicting he would fight every two weeks. As promised, Santiago returns in Dover, DE in 14 days (2/21). Let's hope he does keep a breakneck pace as a pro. It will be fun to see him develop. 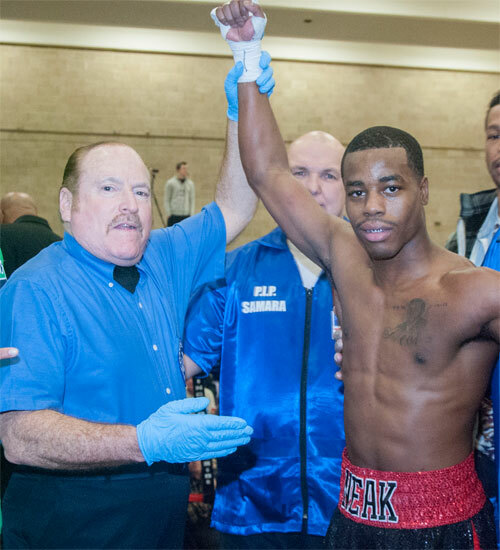 In the scheduled 6-round semi wind-up, southpaw Derrick Webster, Glassboro, NJ, returned from a one-year layoff to stop Julio Garcia in round five of their super middleweight bout. The fight got off to slow start, and after a few rounds the Armory crowd started getting bored. Webster was dominating the fight but seemed satisfied with a one-sided shutout. However, the crowd let it be known that they did not share Webster's complacency. In round four, the restless crowd began to boo. At first, Webster did not hear them. However, as the volume of the boos started going up, suddenly Webster took notice. Suddenly he stopped fighting and glanced up at the bleachers, only to hear more, and even louder boos. Webster smiled and shook his head in disbelief. However, he immediately began pressing Garcia. The round ended before he could make anything happen, but Webster came out for the fifth with that same good pace. Webster rocked Garcia with a booming right upper cut and followed it with a hard left. With his opponent wounded, Webster moved him to the ropes and pounded away until referee Shawn Clark jumped in to stop the fight at 1:19 of round five. Webster got his 8th career KO, but he should thank the Armory crowd for it. He threw the punches, but it was the crowd that spurred him to do it. Let's call it an assist. Webster remained undefeated at 15-0. Garcia, of Rincon, PR, slipped to 6-6 with 3 KOs. Star-in-the-making Emmanuel Folly won his 4th consecutive fight with a vicious TKO of Michael Varela at 2:52 of round one. 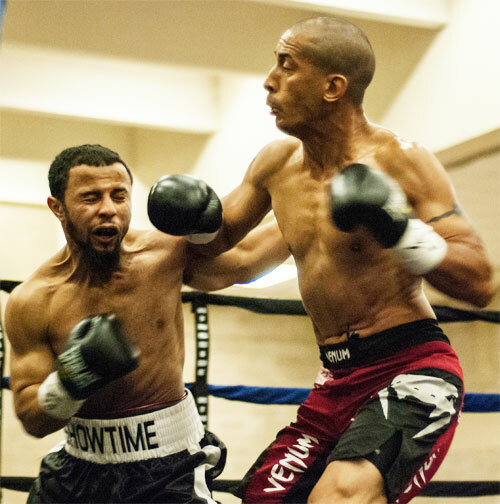 Folly, of the Rock Ministries Gym in Kensington, roared out of his corner at the beginning of the bout, and attacked Varela like a tiger. Varela never had a chance. Finally Folly drilled a nasty left to the body and swarmed his prey until Steve Smoger saved Varela, 0-2, just before the bell ended the first round. Folly wanted more, but the rules, and Smoger, prevented him from doling out more punishment. With the win, Folly remains one of Philly's brightest young talents. The junior featherweight pushed his record to 4-0, 3 KOs, and began his sophomore year as a pro boxer. Without question, this guy is a fighter to watch, and I can't wait for his next bout. 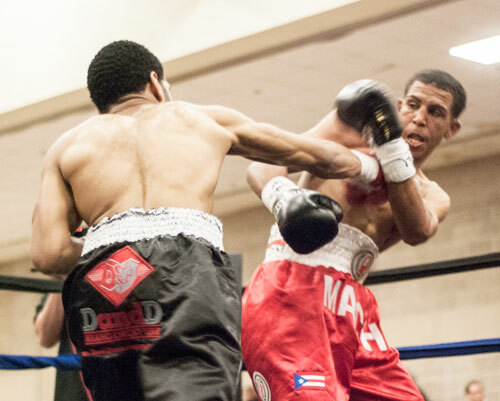 To me, Philly junior lightweight Frank Trader (above in black trunks) appeared to comfortably win his slow-moving 4-rounder against southpaw Israel Suarez of Luquillo, PR. However, only one of the official judges had him in the lead after four rounds. 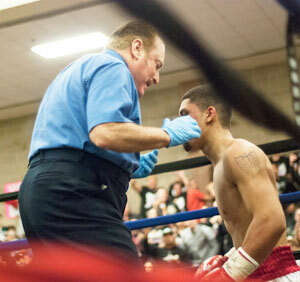 Judge John Gradowski scored the fight 39-37 for Trader, while Eric Dali and John Poturaj saw the bout a 38-38 deadlock. The result went into the books as a majority draw. Trader left with a 10-1-1, 2 KO, record. Suarez wound up 4-3-2, 1 KO. The result was unsatisfying, but fans won't be calling for a rematch anytime soon, as the bout was a bit of a snoozer. Philadelphian Anthony Flores returned after a two and one half year "retirement" to win a 6-round unanimous decision over hard-luck vet Ramesis Gil of the Dominican Republic. A few of the rounds of this lightweight fight were extremely close (especially the first), but my scorecard favored Gill 59-55 after six rounds. Gil appeared to hurt Flores in rounds two and six, but still all three official judges awarded the bout to Flores. John Poturaj scored it 58-56, while both John Gradowski and Eric Dali had it 59-55, all for Flores. Apparently the judges gave those close rounds to Flores and only credited Gil when his heavier punches found Anthony's chin. 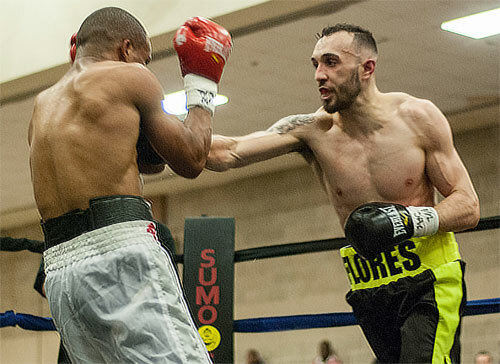 Flores moves on with a 10-4-2, 6 KO, record. Gil continues his thankless campaign at 8-8-5, 5 KOs. 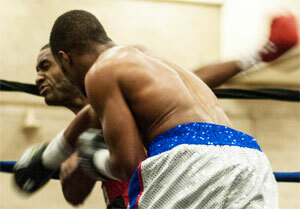 Featherweight Antonio Dubose took a 4-round unanimous decision in his bout with Michael Haigood of San Diego. "Tony the Tiger" Dubose took command of the fight from the outset. A trio of good right hands found their mark in the first. 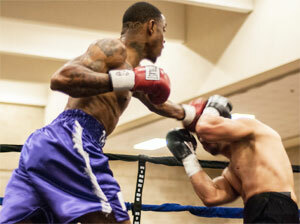 Dubose chased and punched his opponent over the entire course of the fight, but Haigood kept moving and kept surviving. Once in round three, another right sent Haigood to the floor, but he made it to his feet and endured. 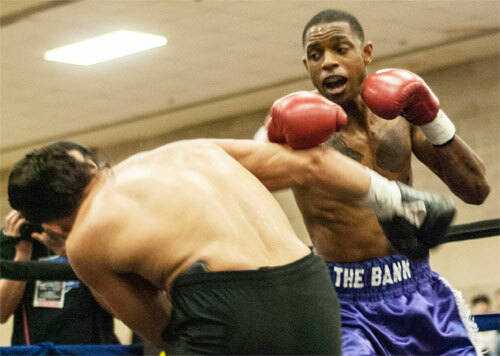 Dubose continued to attack in the final round, landing a good left hook in the middle of his mostly right handed storm of punches. However, Haigood made it to the finish. All three judges, Joe Pasquale, John Poturaj and Eric Dali gave every round to Dubose, turning in scores of 40-34, 40-35, 40-35, respectively. My score was 40-35. 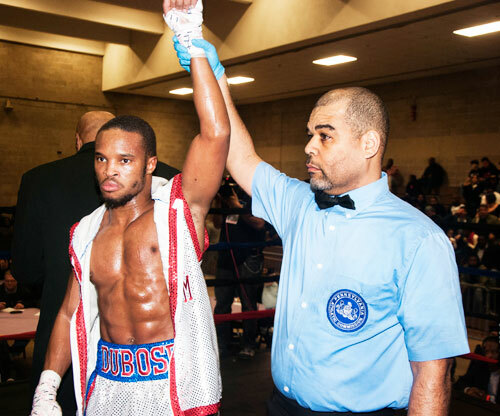 Dubose, 4-0, 2 KOs, is another of Philly's best and most exciting young talents. Haigood fell to 0-2. Philadelphia junior welterweight Sultan "Showtime" Staton opened the show with a shutout 4-round decision over Puerto Rican southpaw Mike Eroza. 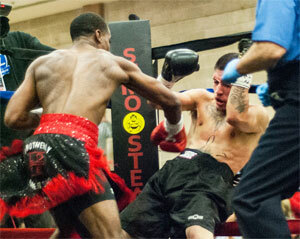 Staton swept through all four rounds, but could not stop is durable foe. Judges Pasquale, Poturaj and Gradowski all scored the fight 40-36. My score was the same. This was the first show of the year for Greg Robinson's Power Productions, and it was an entertaining one for the more than 1,000 fans who came out. In the less than two months of 2014 so far, there have been two fight cards in the city of Philadelphia. Another is slated for March. Let's hope this pace remains for the rest of the year.